This photograph must be the saddest, the most tragic image I’ve ever posted on this blog. 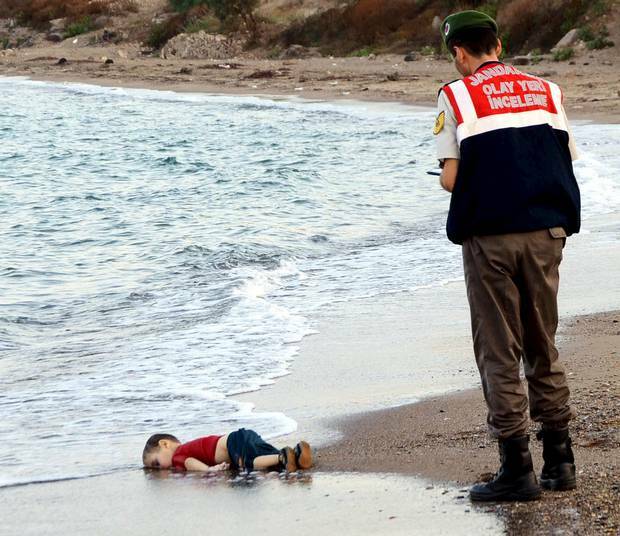 It shows a dead Syrian boy, lying face down, drowned, washed up on the Turkish coast. The UK’s Independent newspaper printed it earlier this month, prompting a huge public outpouring of grief and support for Syrian refugees, which appears to have pressured our Prime Minister into accepting 20,000 of them to seek refuge in the UK. You might be forgiven then, for assuming that the child drowned in some desperate attempt by his family to flee war-torn Syria. But that’s not what happened at all. The family of this unfortunate child killed him by placing him in an unseaworthy vessel, in order to leave a country where they had already found refuge and were completely safe, to attempt to enter another country without permission. If they were ever refugees, they were certainly refugees no longer. At this point they were economic migrants. Would-be illegal immigrants. Despite this, the photo was redistributed endlessly on social media in a campaign to highlight the plight of refugees. “We must do more to help!” bleated one of my Facebook friends. “AT WHAT LEVEL DOES THIS HAVE NOTHING TO DO WITH FLEEING PERSECUTION OR ESCAPING A WAR-TORN COUNTRY?” screeched another easily-led contributor, responding to a post that spelled out the answer to her question in terms her seven-year old daughter should have been able to understand. People are so effortlessly manipulated by the left-wing press. Rather sad, isn’t it? This entry was posted in Uncategorized on September 19, 2015 by admin.